Meanwhile, the weekend before I started, Tom and I took a weekend break and drove down to Curio Bay in the Catlins. Our intention was to see some penguins and take a few walks. We found a place to stay along the beach called Porpoise Bay – named for the endangered Hector’s dolphins that like to live there. From our spot, we could walk to the nearby petrified forest which was truly amazing – I’ve never seen anything like it! In the evening, we saw a pair of rare Yellow-Eyed penguins appear here and make there way up into the scrub to their nest. It was one of the most magical things I’ve seen to watch these adorable creatures make their way home. Before we set off on our own way home, we walked out to Porpoise Bay early in the morning and were rewarded with a pair of Hector’s dolphins cruising through the surf! I don’t think I got any good photos as most of the time they were only shadows in the waves, but it was also pretty spectacular to see them surfing about and enjoying the early morning rays! 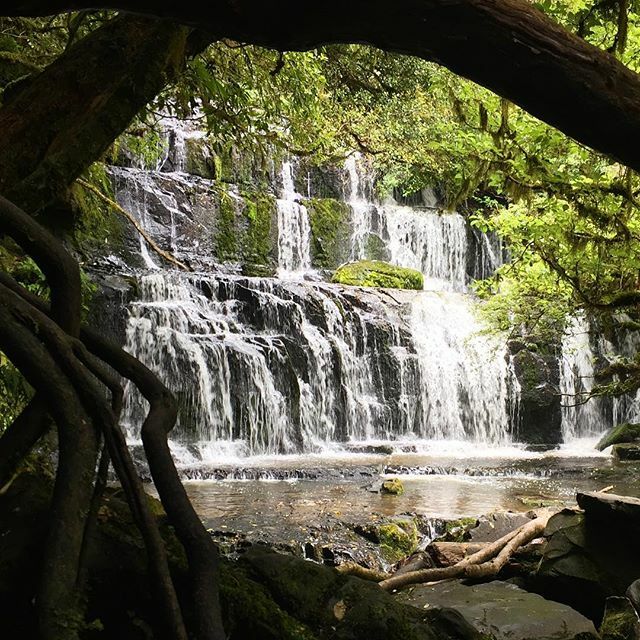 On the journey back to Dunedin, we walked out to the lovely Purakaunui Falls. They are supposed to be more impressive after a heavy rainfall, but I thought it was extremely pretty. Our final trip was the hike out to Cathedral Caves – only accessible at low tide! It’s probably a tourist trap (you have to pay to walk out along private property), but it’s a very lovely area nonetheless, although the hike out is quite steep!